White wine is close to being the perfect match for cheese – and generally pairs better than red wine. The freshness of the white wine, the perfumed notes and the combination of sweetness and acidity suit many cheeses. However, it is important to pair the right wine with the right cheese. You may have heard it before: you should be drinking white wine with your cheese instead of red. And this is indeed true. It’s not just a crazy notion developed by snobbish wine-and-cheese types. White wine is simply much more suitable for serving with cheese than red. The milder bouquet, the acidity and any sweetness of white wines complement cheese better than the robust tannins and slightly metallic taste of red wines. However, white wines – like cheese – come in countless varieties and not all types are suitable for all cheeses. The wines may be light, heavy, young, old, fresh, sweet and much more. And each wine is best suited to a specific type of cheese. The trick is to experiment and note what you think works best. 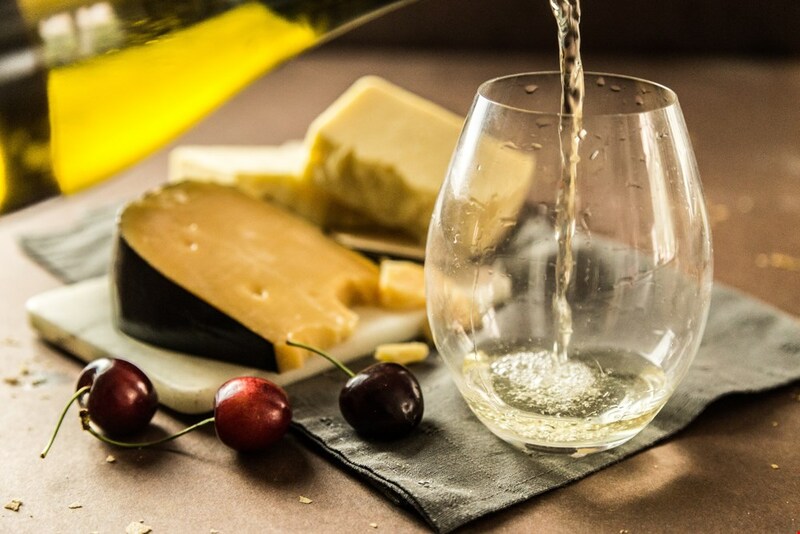 In general, however, it is a good idea to serve – if you can – a couple of different white wines with your cheese, especially if there are several different types of cheese. For example, try serving a fresh wine and a more complex wine so you can experience the difference. You might also try serving a young wine and an old wine. White wines can be both sweet and acidic at the same time, and this combination generally goes very well with cheese. As a rule, try to avoid serving very dry white wines with cheese. Instead, aim for varieties with a little residual sugar. The sugar in the wine goes nicely with the salt in the cheese, while the acidity rinses the palate, offsetting that slightly greasy feeling. German Rieslings, in particular, can be a perfect match for many cheeses. Try the slightly sweeter varieties which generally have a beautiful balance between sweetness and acidity. Then you will be well on your way to cheese-wine heaven. The rule here is: the more powerful the cheese, the more sweetness and acidity it can handle from the wine. Soft and rich cheeses, such as Brie and Double Crème, often pair nicely with white wines made from Chardonnay grapes. This is especially true of the crisp versions, for instance Chablis in Burgundy and wines that have been matured briefly in barrels. Here, the Chardonnay grape, with its lovely acidity, really brings out the best in the cheeses. Certain Chardonnay wines, such as those from Burgundy and many of the overseas Chardonnays, have spent a fair amount of time in barrels, which makes them bolder and more full-bodied. However, this oaked flavor generally makes these types of wine less suitable for pairing with cheese. Save these wines for flavourful fish dishes. Another good rule of thumb is to serve full-bodied cheeses with full-bodied wines – and old cheeses with old wines. Very light cheeses, such as cream cheese, go best with a young, crisp white wine, while more flavorful aged cheeses require a more robust wine companion. If you have an old, creamy, amber, aged white wine, whether it is a Riesling or Chardonnay, serve it with flavorful aged cheeses. For instance, an aged Gouda or Havarti. It is often said that what grows together, goes together. And this is also true – at least in part – with cheese and white wine. The Loire Valley in France is known for making delicious goat’s milk cheeses, and they go well with white wines made from the Sauvignon Blanc grape grown in the same region. 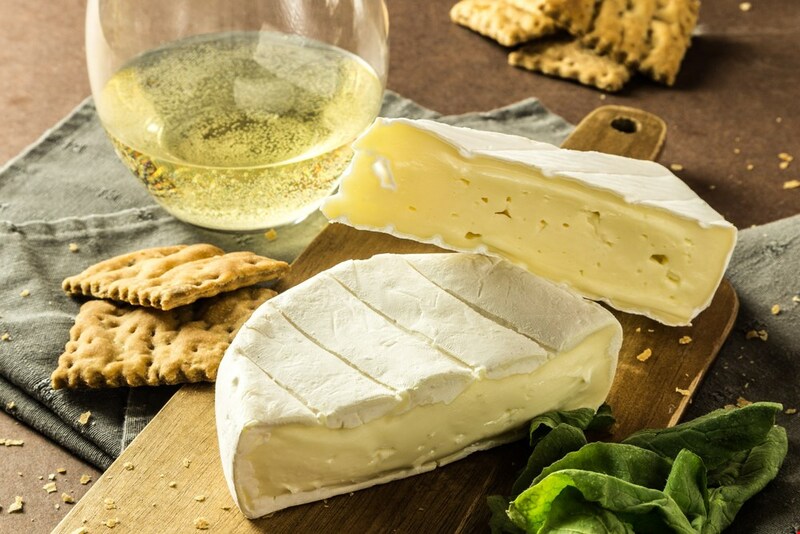 In general, goat’s milk cheese and Sauvignon Blanc make a lovely pair, just as other perfumed white wines, such as Gewurztraminer, pair nicely with full-bodied soft cheeses. Here, the floral notes bring out the liveliness in the cheese. Very salty and complex cheeses, such as blue cheeses, are generally served with sweet condiments. You may have noticed that orange marmalade, figs and raisins often accompany these types of cheeses. And you can also serve a wine with these same raisin and nutty aromas. In general, sweet wines are ideal with blue cheeses, because the sweetness embraces the saltiness and tones down the slightly moldy taste. Late harvest wines, with the high sugar content in the grapes, go particularly well with blue cheese. Try, for instance, a French Sauternes or German Spätlese – or even better, a bold, sweet and complex Auslese or Trockenbeerenauslese from Germany. The prices may be high, but then so is the experience. And if can you get hold of one, a genuine Eiswein is also worth a try. 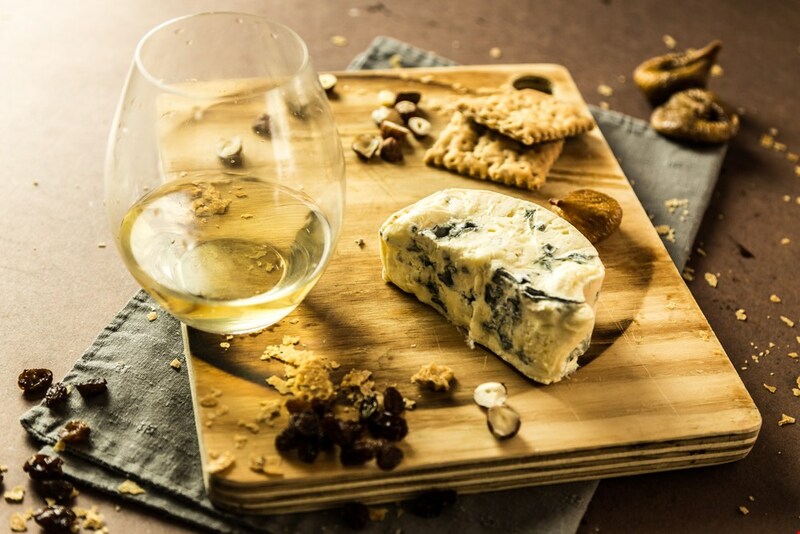 Actual dessert wines – especially if they have notes of dried fruit – also pair very well with blue cheese. As you can see, there are many possibilities, so the best tip is to experiment and be open to exciting combinations. Fortunately, that’s a big part of the fun. So uncork a couple of your favorite white wines and set out a few cheeses. After that, you simply taste a little cheese and then a bit of wine. Just remember to take your time – make sure to taste the cheese alone and with the wine. Let the taste fill your mouth and note the details. And enjoy what happens when the cheese and wine meet each other. What happens with the acidity, the creaminess and the sweetness? What do you observe?